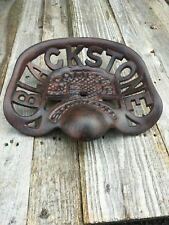 Cast Iron Tractor seat. It is your responsibility to be in to receive your goods. It is your responsibility to be in to receive, check and sign for your goods. This is your opportunity to ensure you are happy with your order. Kasli is a famous center of the artistic casts made of cast iron - Kasli iron sculpture. The cast sculptures of Klodt, Lancere, Solov'eva and other prominent artists are among the most famous works in the museum of decorative castings. Great little reproduction cast iron pigeon. All cast iron hand painted, slightly distress as shown in the images. Certainly looks old! 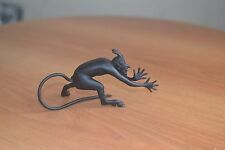 See our other miniature cast iron animals! Teapot does not have its strainer. 19th Cent. Japanese Iron teapot. Small teapot, see ruler pics. No holes, no dings, pretty mt fuji scene. I'm told a more exact date is listed with the makers mark next to the spout in Japanese, see pictures. 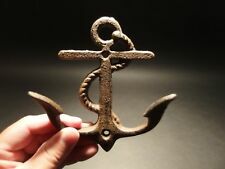 Such a neat reproduction cast iron fouled Navy anchor wall hook. 5 1/4"Tall x 4 3/4" Wide x 1 1/2" Extension. 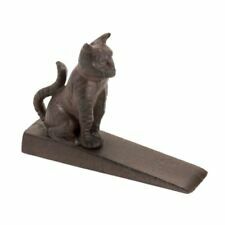 The finish is a very sturdy reddish brown and black baked on powder coating. A superb 19thc gothic cast iron gargoyle and serpent doorstop. Fine gothic gargoyle with large wings and with a serpent with forked tongue. To back of the wings is a raised Victorian lozenge mark and impressed numbers to other wing. Made of iron and decorated with brass ; very difficult masterwork. 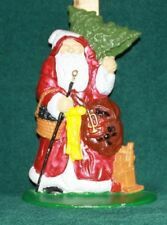 REAL size and perfectly detailled ;beautiful decorative piece. JHB R. 740410. ANTIQUE NUTCRACKER. ~ Skull & Bones ~. c 1890`s - 1900 `s ENGLAND. Total length ca 15 cm __ 6". Great sturdy reproduction antique iron hook latch door or gate lock. All heavy solid iron material with a brown black powder coating. The item in the images is just a model. Egyptian Revival Magazine Stand / Rack. the Art Deco / Nouveau Periods. Cast Iron With A Rich Bronze Finish. Hook Into Each Other. Very Rare & Near Mint! Near Mint & From A. - Attributed To Nu Art. For your consideration is this antique Circa 1903 Facile cream separator. This dairy centrifuge cream separator is constructed of cast iron with four (4) copper tubes and a wooden crank handle knob. 6" Overall height, 4" Extension, 3 5/8" Wide. Great distressed oil rubbed brown look! 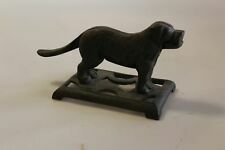 RARE HTF ANTIQUE HUBLEY #105 CAST IRON HUNTING DOG W/ DUCK DECOY DOORSTOP NICE! Great rare antique Hubley cast iron hunting dog with duck in its mouth #105. NUMBER is marked on the back. Nice size with original paint. Wear is consistent with age and use. This boot jack is much thicker, and heavier then other similar ones we have seen. As you can see it has an internal kickstand. Certainly a great item! Be sure to see the images, for construction and manufacture details. Cast hook reads: PAT DEC.21.69. 1 Charming and functional sturdy iron wall hook cast in iron from an antique. 9 1/2" Extension x 2 3/4" Wide 5 1/2" Tall. Dresde is in east germany and Moshage decide to work after the second worldwar not in east. So he changed with his motives to. Buderus Hirzenhain the goost Iron from 1875 to 2015. This now 275 jear old manufactury. Solid cast iron, very strong little grille complete with slotted head screws. Round Antique Style Air Vent Cover. THIS POT IS VERY HEAVY. FOR GREAT BUYS! Notice the 4 fully rotating bottom hooks. 1 Charming and functional sturdy iron wall hook cast from an antique. Cast hook reads: Henkel Brattleboro VT, Pat July 1895. All Heavy cast iron. 4 1/4" Wide 6" Extension. Great sturdy iron wall hook cast from an antique. 6" tall x 3 3/8" Wide x 3 3/4" Extension. Great blue finish! Great sturdy iron wall hook cast from an antique. 5 1/2" Tall. 2" Wide 4" Extension. Great textured black/brown color powder coat. a very sturdy finish. This is an Exceedingly Rare Antique Cast Iron Paul Revere Bowl. Large Gate Mark on the Bottom. Dates Back to the Late 1700’s or Early 1800’s. Multiple orders will be combined. Good luck! Original c ondition. THIS IS AN ANTIQUE FOOT REST FOR A SHINERS BENCH OR CHAIR. 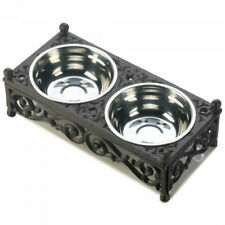 IT IS MADE OF CAST IRON WITH NICKLE PLATE OVER THEM. IT HAS THE 3 HOLES IN THE BOTTOM TO APPLY THE SHOE REST TO THE BENCH OR CHAIR. IT IS VERY VERY FANCY WITH THE ETCHING ON EACH SIDE OF IT. As shown, this has cast in raised letters - MONITOR - 88 - F. H. HAINES - P. ISLE. 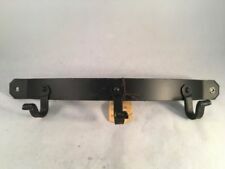 A flat bar hanging bracket has been gas welded on the top back for hanging. The original door handle has been gas welded in place. We specialize in high quality reproduction antiques.Many of these reproductions were inspired by actual antiques and can be found in many antique reference books. It is included. The surface of the cast iron is pock-mocked from age and is slightly oxidized in places. It hasn't been touched and hasn't been repainted, dressed in stove black or otherwise touched. The tooling is uneven and obviously hand-made. It makes for a beautiful centerpiece, also in front of a low light makes a silhouette. Mounted onto a black granite stone with a felt cloth bottom. THE ARE IN WONDERFUL AGED CONDITION FOR BEING OVER 100 YEARS OLD, CIRCA 1890. Dresden is in east germany and Moshage decide to work after the second worldwar not in east. So he changed with his motives to. Buderus Hirzenhain they goost Iron from 1875 to 2015. This now 275 jear old manufactury. Antique 20" cast iron wheels. Weighs 24 lbs. 12 spoke; heavy spokes. Cracked hub on one side. Pics show it well. I have one more identical matching wheel listed; this one is #2. 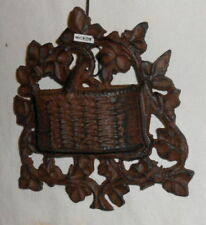 Wonderful reproduction key hook. The key is fixed in place doesn't not remove or turn. 5" Tall x 4" Extension 2 1/8" Wide. Believed to beBradley & Hubbard .